For those of you who know Dave, you probably already know that I hit the jackpot when it comes to husbands that help without being asked. Dirty diapers, dishes, spanking naughty children…the list goes on and on. It’s so nice that I don’t have to do it all myself! All joking aside (he never changes dirty diapers), he is a rock star at graphic design. I know I am 100% biased here, but just indulge me. As we were decorating for Christmas, I told him that I needed something red for the mantle and could he, pretty-please-with-a-cherry-on-top, make me a print that I could hang on the wall? He totally delivered. And since he was on a roll, he made another one from the Christmas hymn, Angels We Have Heard on High. I have it up next to our nativity, which seems like the perfect spot for it. Aren’t they pretty? Good news is that they are available for everyone! It’s a Festivus for the rest of us! It really is something you should click over and check out. Like I said, he’s a pretty good designer, and the fact that he changes dirty diapers is a bonus. For me. He doesn’t just change anyone’s dirty diaper. That would just be creepy. IT’S ANOTHER FESTIVUS MIRACLE! Here’s a promo code for friends and family (or anyone really). Enter XMAS25 to receive 25% off! It’s so nice to have a creative husband. Not only would I never think to do this for my kid’s lunch, I probably wouldn’t have the energy to. Dave comes home for lunch almost every day. His commute is only about 10 minutes, so it’s pretty easy for him to do so. It’s nice for all of us to have a little extra time with him. Especially Miss Olive, who usually prefers the company of me to anyone else (unless she’s facing out and can’t see who is actually holding her). The individual attention that he gives to Inez and Gwen makes me just a lit-tle jealous sometimes. It’s no wonder that they are such Daddy’s girls. I have a feeling that Olive will become one too. I just finished reading Brain Tracy’s Goals, which is sort of like The Secret without all the crazy. One of the book’s main themes is that in order to achieve your goals, you have to get specific about what you are trying to accomplish. Doy, right? The author says you should write down your 10 to 15 major goals every day. At first, I thought that writing them down every day would just be busy work. But, I’ve been doing it for the last few weeks and it’s been really amazing. The key is to not refer to yesterday’s list when you write up today’s list. This forces you to go through the thought process again and again of basically deciding what it is that you really want to do right now. You can’t do everything, you have to choose what’s going to make the list, and what’s going to get weeded out. Because you are rewriting the list everyday, you end up drilling that top ten list into your mind and you end up thinking about your goals a lot more during your daily activities. The author says that after about a month or so of honing your list, you will reach a point where you list becomes almost identical every day. I’m pretty close to that point now. I communicate sincerely with my Heavenly Father through prayer at least twice daily by December 31, 2008. I read the Book of Mormon cover to cover by December 31, 2008. I attend the temple with Holly at least once each month by December 31, 2008. I go out with Holly (no kids!) once a week by December 31, 2008. I have no debt (other than our mortgage) by December 31, 2008. I have (and hold to) healthy eating habits by December 31, 2008. I run five times a week by December 31, 2008. I lift weights five times a week by December 31, 2008. I weigh 170 pounds (or less) by December 31, 2008. I launch the side project (that I’ve been daydreaming about for the last two years) by December 31, 2008. There it is. It’s now public. All three of our readers will mock me in the street if I don’t follow through with these goals. I was reading a few of our old posts this morning when I stumbled on the brief—seemingly temporary—birthday post that Holly wrote for me on my birthday. In it, she promised that there was “more to come later.” I searched through all the other posts since then and wasn’t able to find this “more” that she mentioned. Hmmm. I did find her ode to James McAvoy though. So, that’s something. I don’t mean that I’m a “a stupid, irritating, ineffectual, or unattractive person” (thank you, dictionary.com)—although, I suppose whether or not that definition fits me is debatable. I mean that I, at times, can be a bit of “an intelligent but single-minded person obsessed with a nonsocial hobby or pursuit” (thanks again, d.c). See? I just called a website by a nickname! A nickname that I made up for it! NERDY. Now that I’ve written all this out and had a chance to look it over, my evidence of nerdity doesn’t stand up too well. Nonsocial? Check. Single-minded and intelligent? Not so much. Hmm. Maybe I’ll go back to the first definition. P.S. Here’s one last link: I’m not sure what to do with this. P.P.S. Forget what I said about watching Gilmore Girls. 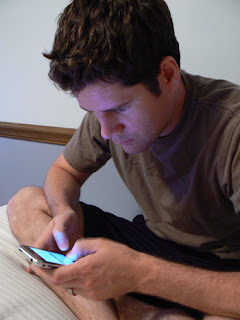 Dave has been forced to divide his attention all night between me and the iPhone. I must say, he has given me ample attention. I’m satisfied. But maybe, just maybe, he’s buttering me up so that he can get one of his own. If we could, I would so let him get one—he works many, many long hours. He deserves one. How about one made out of cardboard for now, hon? Today marks five years of our marriage. P.S. Happy tenth Anniversary to Beth & Fo’ou today too! Update: The following happened to Dave (not Holly). We apologize for the confusion. This last Sunday, after unloading our girls, diaper bags, manuals, scriptures, and kitchen sinks from the car and heading into our local chapel (Right on time, of course! And by “right on time,” I mean “20 minutes late.”), I paid a quick visit to the men’s restroom. As I was leaving (still in the doorway), a fellow church-goer passed in front of me, moving quickly. I took a step back and to the left in an effort to avoid a collision. In doing so, I unknowingly hooked one of my back pockets onto the claw-like handle of a drawer that was built into the hallway wall—just to the left to the restroom door. I began to walk away (in my memory, this next part happens in slow-motion) and the inevitable ripping sound followed. I stopped. One of my eyes twitched involuntarily. I felt a light breeze on the back of my legs, that under normal circumstances, would have been refreshing, but in these abnormal circumstances, was most certainly not. When he was drawing up the plans, did the architect of this chapel foresee me, years later, standing there, pale-faced and ventilated, in his corridor of shame and laugh maniacally? I’ll bet he did. I covered my back-side with a church manual, shuffled out of the building, drove home, and changed pants. Did I return to church that day? Yes. Did I return with dignity? No. No, I did not.